IT’S FUN TIME AGAIN! Think Tennis! The Summer leagues are forming now. The USTA Tri-Level League and USTA Mixed Doubles League team formation registration opens on April 1 (no fooling!) and closes May 15. 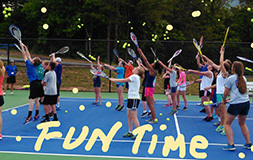 Get your Tri-Level and Mixed Doubles teams organized for summer fun! Players may be added to the teams until July 15.